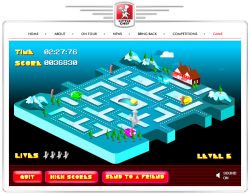 Dodge the meanies and collect all the dots in this isometric Pacman-style game. It’s not massively original, but the graphics and sound are lovely, and it plays great too. Collect the ingredients for a big breakfast amongst the 10 uniquely psychadellic levels to get the chance to take out the baddie trucks. Combos earn you bigger points if you can manage them without getting caught.